The home we live in is smallish with very limited storage space and no coat closet, so finding clever ways to store our things is a must. 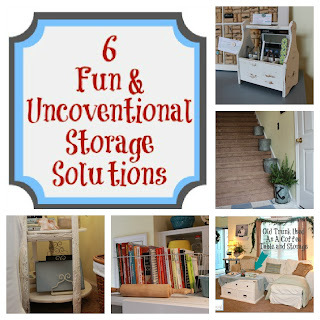 I am always looking for new ways to get organized, and I am not a big fan of storage bins or anything plastic for that matter, so I really try to think outside of the box when it comes to storage containers. There are so many fun ways to store your belongings…you just have to open your mind a little. I painted an old silverware holder that used to belong to my Grandma to hold pens, glasses, and a calculator on my desk…right by my Old Window Turned Wine Cork Board. This is one of my faves…a $5 mail sorter turned charging station to hold my laptop, iPad, and Kindle Fire. 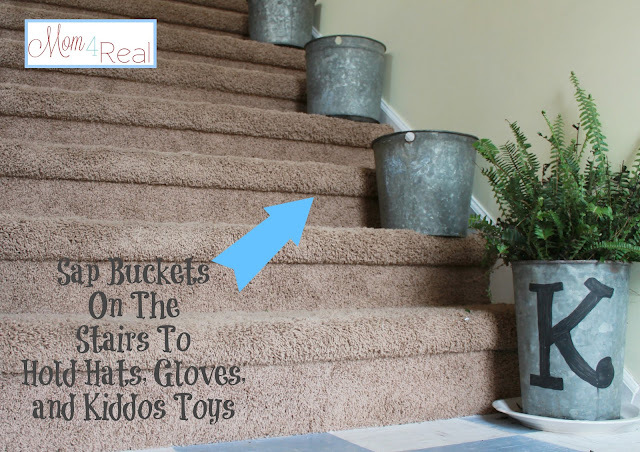 Sap buckets going up our stairs to hold hats, gloves, stray toys, books, and whatever else the kiddos have left lying around. A large wire basket to hold my cookbooks. It sits right on top of my refrigerator so I can easily access them. No more wasted space there! 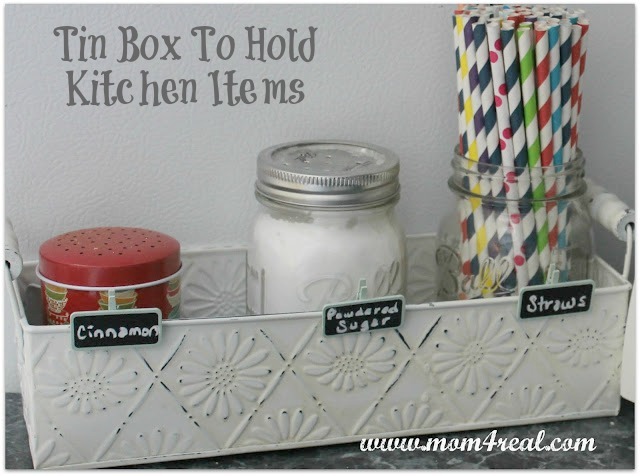 A tin box to hold some kitchen essentials…and Ball jars to hold powdered sugar and straws…too cute! And finally, my favorite…the Painted and Distressed Trunk that Matt made in highschool. It serves as our coffee table and stores all of my books and photo albums. So, do you have any clever storage solutions? Linking to House Of Rose Winter “Organize It” Linky Party! I love me some organization… these are GREAT ideas! My favorite is the buckets on the stairs. I’m always putting things on the stairs to remember to take up with me, and so they always look cluttered. What a great solution! Great tips! I love the buckets on the stairs easy access as you go. Love these!! And the sorter for electronics…brilliant! 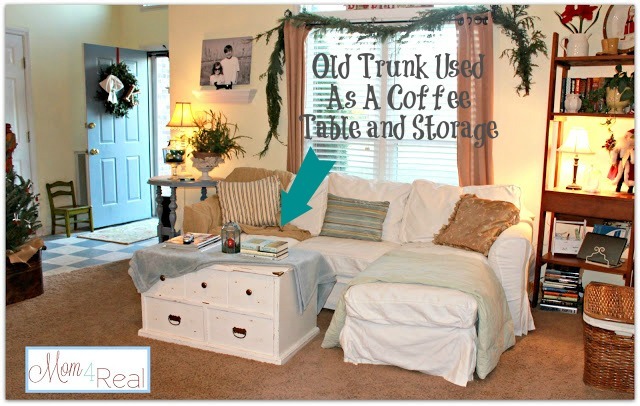 Great tips, I especially love the old tool box! Great storage ideas Jessica…love the mail sorter “computer & such holder”….fantastic!.. 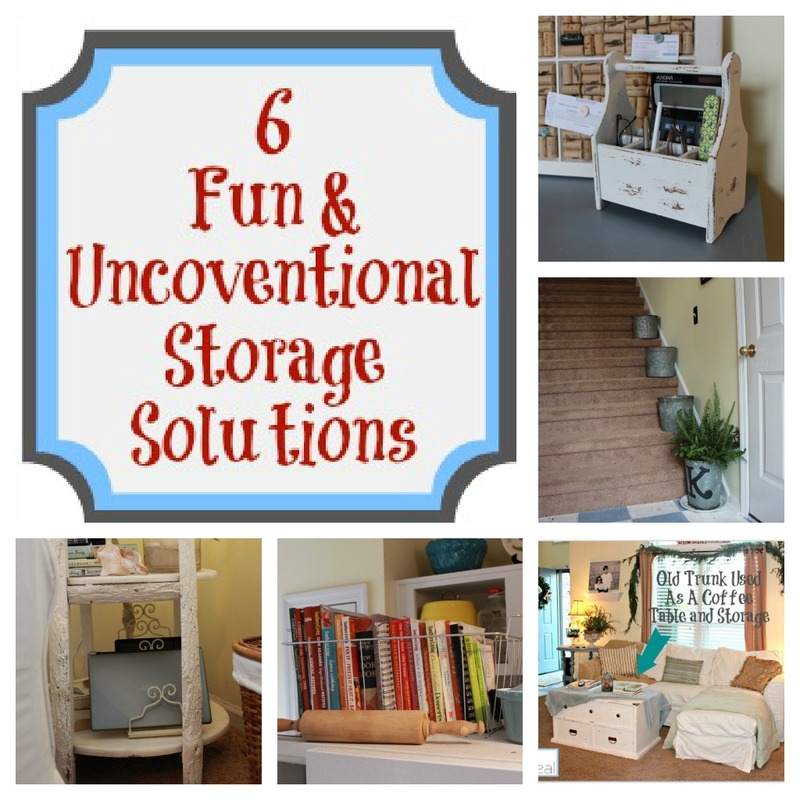 These are great storage ideas! You rock! What great but cute ideas. We have a house with a lack of storage as well. 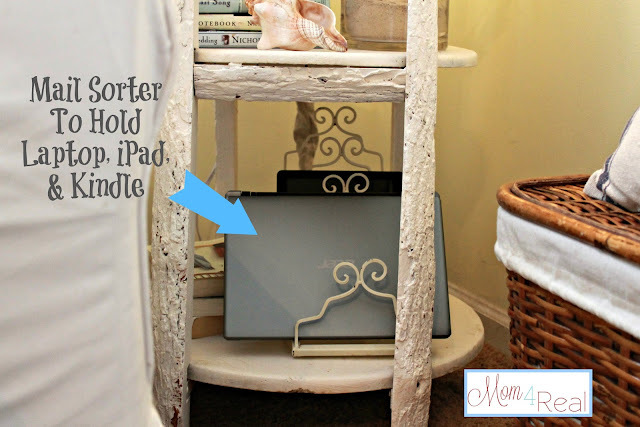 Love the letter holder that hold your electronics. Genius! Wow! I love all these ideas … so clever yet so pretty! Great ideas!! I love storage. My house has no attic or basement. Everything has to have a place or it stacks up on the counters! Thanks for the tips! The are great ideas, I love that they are cute AND functional. 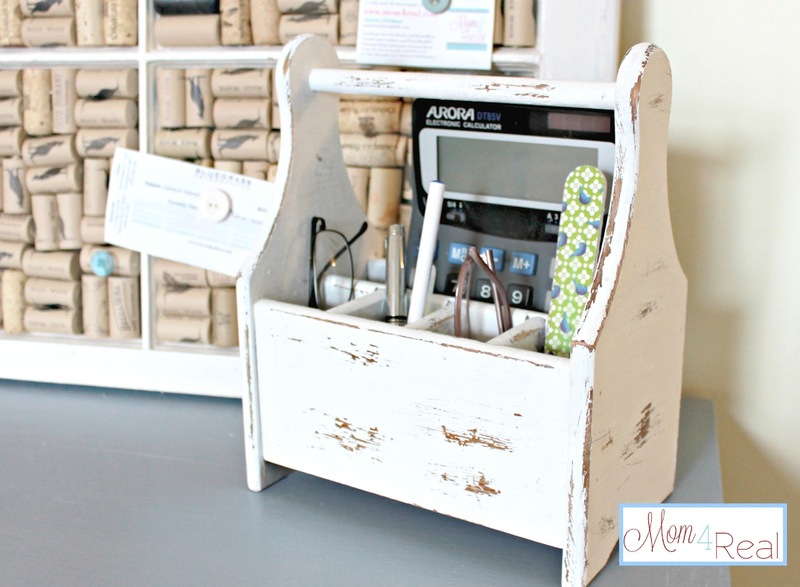 I especially love that letter holder charging station…genius. I love the sap buckets and the wire basket for the cookbooks. I absolutely love cool storage ideas! Thanks so much for sharing! Great ideas! And they are all so cute and add such character to your home. I loved looking around! You have such a cute house, thanks for sharing organization tips, I enjoyed your creativity! Lovin the metal basket storage! 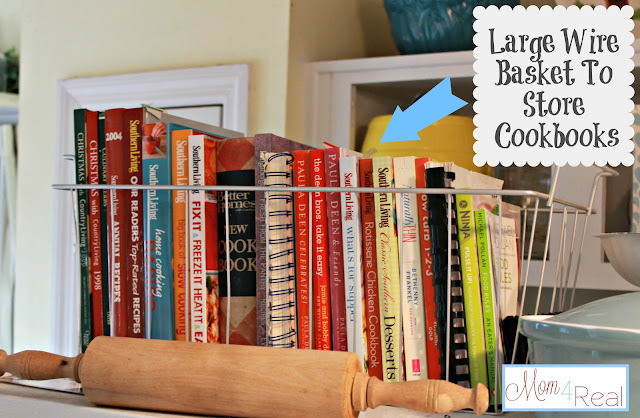 I am a galvanized metal basket freak and use them to store all sorts of things! One day, when my college age daughter moves out on her own….her bedroom will become my knitting studio! As a knitwear designer, I have an overabundance of yarn, needles, books, patterns, fabric, notions etc. They are overtaking the bedroom! Lovely blog, thank you. I found you via I Heart Naptime. oooh I love all these ideas! Hi Jessica! I also live in a tiny house, thanks for the inspiration!